These models are highly prized by not only vintage watch collectors, but car collectors as well. 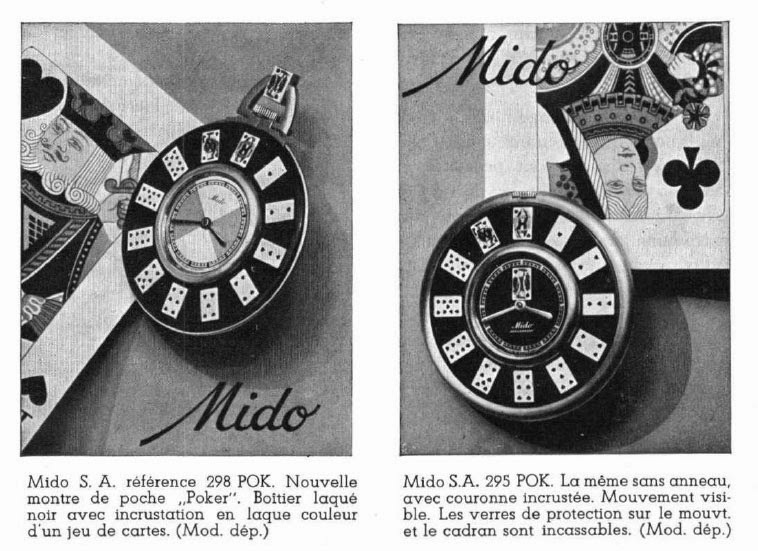 What you may not know (or at least I didn't) was that Mido was famous for producing numerous novelty watches through the years. I uncovered several of these during a visit this past week to the NAWCC Library & Research Center in Columbia, Pa. I try to visit the library every couple of years or so to mine raw date for my articles and, now, my blog. My visit this time around gave me a chance to meet the new Library Director, Sara Dockery, as well to visit with Nancy Dyer, Librarian/Archivist and longtime friend. I also got a chance to meet the the new Watch & Clock Bulletin Editor, Monica Elbert, with whom I was very impressed and am confident will carry on in the best tradition of the magazine, and add her own unique interpretation to it as well. These latest watches were unearthed by going page-by-page through old issues of the Swiss Horological Journal (SHJ) from the 1920s, '30s, and '40s, which are kept in bound form in the Library's archival section. This blog entry (and more to follow) shows just how valuable this resource is to NAWCC members. The portion of NAWCC members' dues that goes to preserve this resource is money well spent and, sadly, is an under-utilized resource by members. Seriously, if you're an NAWCC member, and your travels take you anywhere near Columbia, Pa., stop in and pay a visit to the Library and Research Center. Visit, don't call! Treasures await the person who is willing to browse in person! 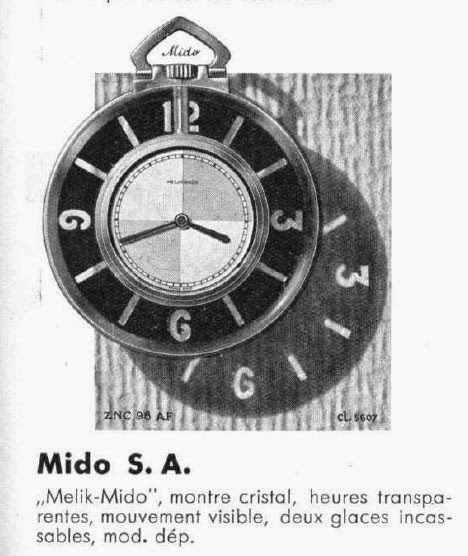 "We wish to draw our readers' attention to a new watch which has come at the right time: the Mido Radiotime, presented by Mssrs. Mido S.A. of Bienne. Every day, millions of people listen the time signal given over the radio or telephone by different observatories. 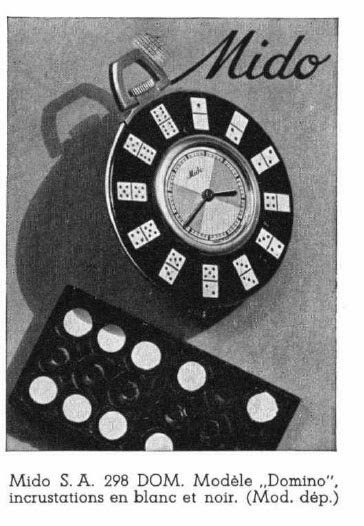 They set their watches as best they can, naturally with more or less precision as no watch, up to now, has allowed the exact registration of the time signal. 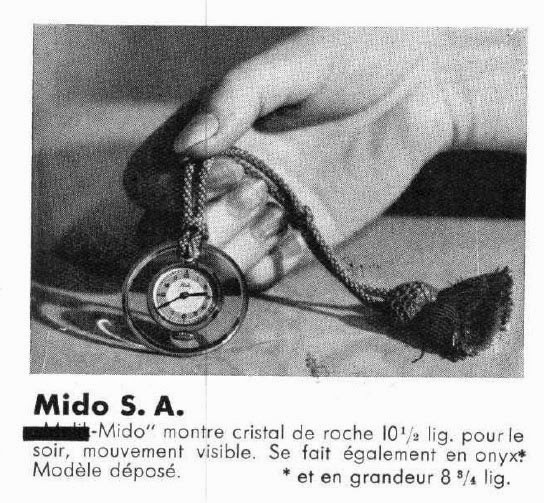 "The Mido Radiotime fills this gap: is is the first watch rendering possible the simultaneous registrations of the exact time, (minute and second) by simply pressing a pusher fitted in the crown. This can be done four times per hours, each 15, 30, 45, and 60 minutes. It's functioning is very simple and exact, the three hands are immediately and simultaneously adjusted on the moment desired. 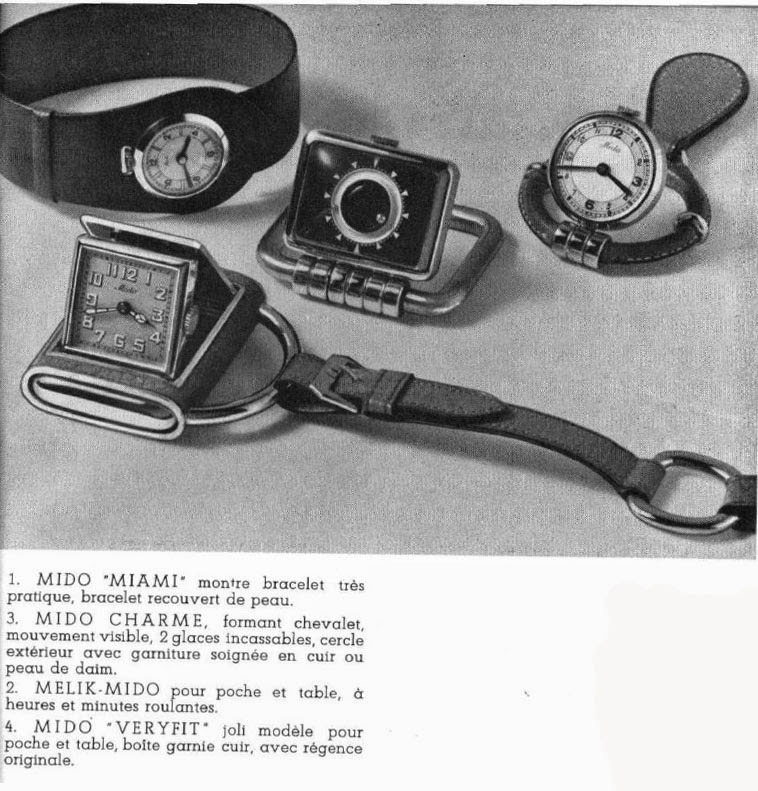 "In this era of the radio, the mew Mido creation will certainly be warmly welcomed." The watch has pictured in the annual "Complete Price Guide to Watches," but its operation has never been explained, nor have I even encountered one. 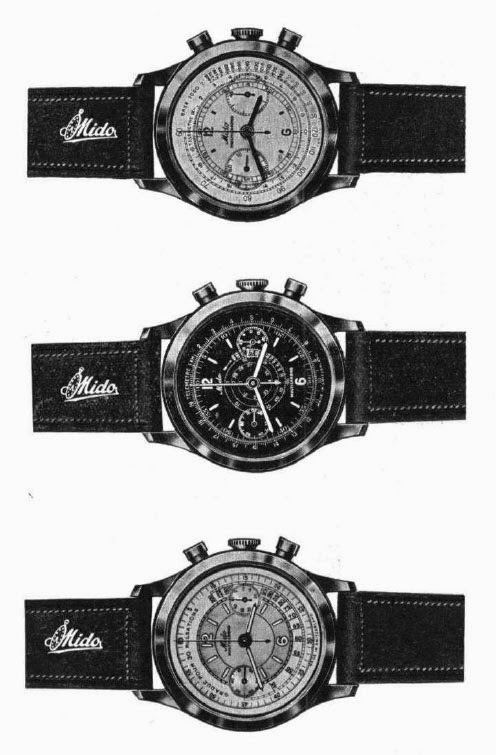 If you have one of these watches, please contact me with any further information you may have. I have an example of the lower model in my own collection, which led me to contact the company. You will notice in the upper example that the world "Melik" was hastily blocked out by SHJ editors prior to printing the magazine. However, they missed the "Melik" in the lower example. My guess is that shortly after producing this model, the company decided to pull it. Why, we do not know. And we have no explanation as to the meaning of "Melik." A Google search of the word reveals that it is principally a word of Armenian origin, indicating a noble title. 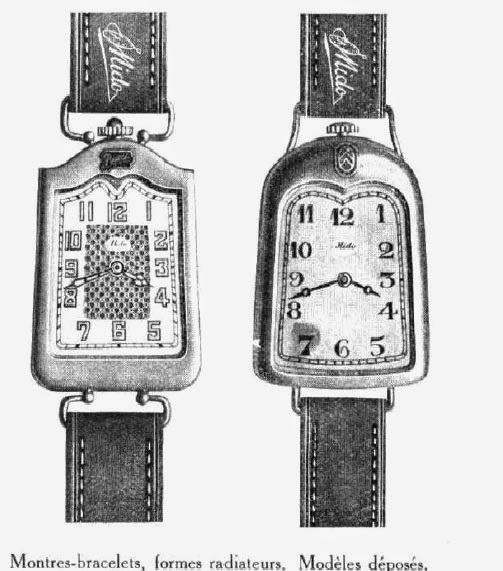 But in any event, this evidence confirms, at least in my mind, that Mido did produce this watch, if only for the briefest period of time! I hope you have enjoyed this little journey through some of the more unusual models produced by this great watch company, now owned by the giant Swiss watch conglomerate, Swatch Group.